Bloodbath was the creative development and beta testing of a live event: . 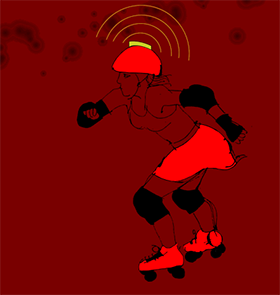 5 artists, who work with data visualisation and or the body, each create a work that responds to live incoming data from collisions in a Sydney Roller Derby League, all-girl flat track roller derby game. Sensors attached to players send information to a server. The server sends that data on to the artworks. Bloodbath Live Event October 2010, Hordern Pavilion, Sydney, Australia. My work for this is titled Axle Grind and features a robotic guitar that is triggered live by bumps and collisions from the players on track. The Bloodbath website can be found here. An article about Bloodbath on TRACES can be found here.